Pacific Bend Inc. offers high quality refurbished carton flow rack systems. Our systems are designed for deep space storage and efficient inventory management. We make uprights, shelves, and roller tracks. 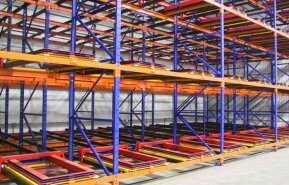 Our carton flow racks combine efficient storage with ample access to inventory. Set at a slight incline, carton flow rack systems create a sloped plane, which is why they can also be called gravity or dynamic flow systems. There are a variety of styles available, including Skatewheel Flow Racks, Column Flow Gravity Racks, Flow Rail Gravity, Flow Bed and Carton Flow Shelving systems. These are designed to use half of the floor space that will involve the availability of more space throughout manufactured warehouses. Carton flow systems can increase storage space by 60% and use less floor space, which will help keep the cost of adding extra floor space unnecessary. The system requires less labor and maintenance. This pallet flow system has a complex motion and braking system to control the speed of moving pallets as they are picked. Carton Flow Pallet Racks systems run on a FIFO (First-in/First-Out) material system that guarantees the rotation of the inventory in stock.